Mesopotamia can be defined as an ancient land that hosted a diverse and rich culture far back in history. It is also known as the ‘land between rivers’ as it was located between two major rivers, Euphrates and Tigris. Today, these two rivers join up to flow into the Persian Gulf. Mesopotamians developed a common religious belief system and had hundreds of Gods that they worshiped. They even had different gods for different professions. Anu, Enil, Nanna, Utu are some of their major gods. Mesopotamia was believed to have been founded around 5500 BCE. It was a large region located in modern day Iraq and parts of Turkey and Syria. Mesopotamians were the first people to understand the concept of zero and to start experimenting with mathematics. Their religion did not believe in life after death. Babylon was the capital of Mesopotamia. Hammurabi was the ruler of Babylon. He brought 282 laws to maintain a system and safety in the city. 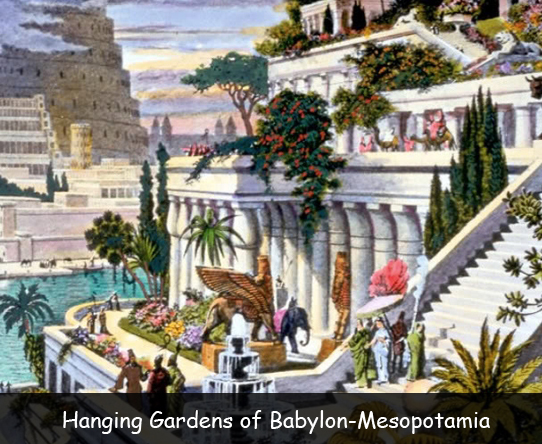 The Hanging Gardens of Babylon are one of the seven wonders of the Ancient World. People of Mesopotamia invented the wheel, plough, sailboat and irrigation system. They considered themselves as servants of God. Money did not exist in their civilization so they used weight to buy and sell different items. The Sumerians invented the first form of ancient writings. In Mesopotamian civilization, priests controlled the irrigation system and had more power than the king and Queen. They had a temple at the center of every city. It symbolizes the importance of the city’s patron deity. Eridu, an ancient site in Mesopotamia was the first city ever created. The Babylonian Law was created by King Hammurabi, known as the Code of Hammurabi. It is the oldest written law in the world. Declan, Tobin. " Fun Facts for Kids about Mesopotamia ." Easy Science for Kids, Apr 2019. Web. 25 Apr 2019. < https://easyscienceforkids.com/all-about-mesopotamia/ >.